The staff of Communities In Schools of Wilkes County has been happy to see the culmination of our 13th Annual Stuff the Bus campaign this year! This outreach effort sees its peak as school counselors and staff come to collect donated supplies for distribution among area learners. With the start of the school year right around the corner, the myriad of questions and inquiries from area parents and caregivers are entirely understandable! As such, we have compiled the following FAQs for your reference and informational purposes. Will these supplies cost anything?No. 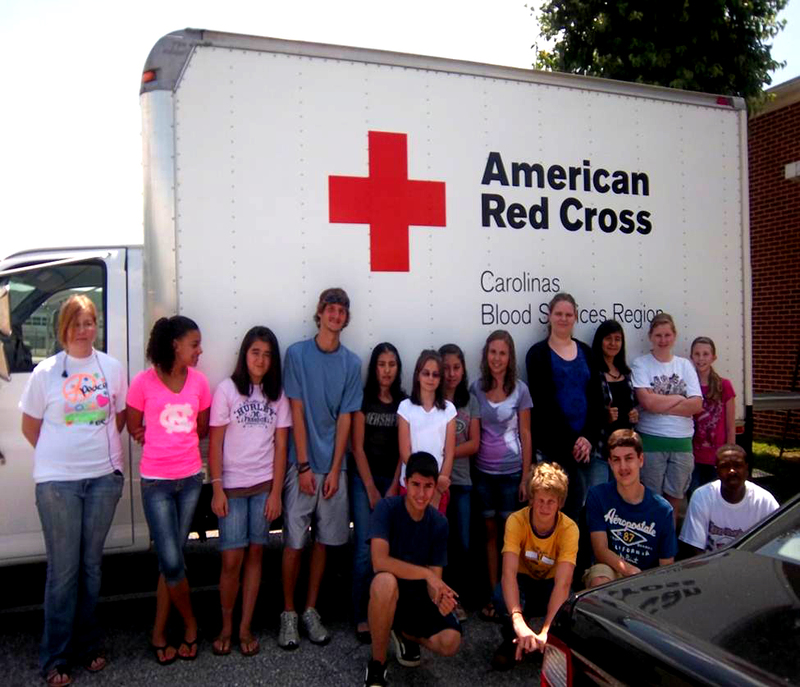 Supplies are collected through in-kind and monetary donations throughout the summer months. Communities In Schools provides these items to area primary and secondary schools to be distributed to students entirely free of charge. Who qualifies for these items? 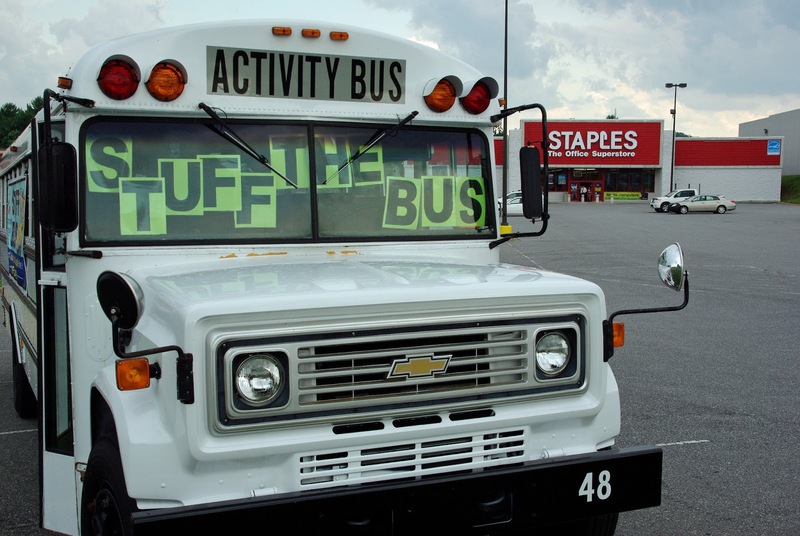 Currently, there are no income requirements necessary to receive free supplies in association with the Stuff the Bus program. All students who do not have the supplies necessary for academic success are welcome to see their school counselors for assistance in procuring these items. How do I / How does my student receive free supplies? Contact the school counselor at any of our public area elementary or secondary schools, including Wilkes Early College. Counselors picked up supplies Thursday, August 21, 2014 — and will have items available for pickup should your student have need. Are any of these resources available at local colleges? Currently, Communities In Schools does not provide any supplies to area colleges, though items are available through Wilkes Early College. Where do I sign up to receive these items? There are no forms required to receive access to these resources. Simply talk to the school administration at your respective school sites — they will be happy to help! Where can I pick up these resources? / Can I pick up these resources directly from your office? Unfortunately, Communities In Schools does not have the space or manpower necessary to undertake the distribution of our materials on site. As such, items will be distributed to school employees prior to the start of the school year. To collect, please address inquiries to your respective school administration. For additional questions or more information, you are welcome to email us at glendora@cisnwnc.org, or contact us by phone at 651-7830. The school year may be over, but we’re still finding ways to enrich the lives of our students here at Communities In Schools. Currently, we’re offering two different options for learners throughout the month of June. One of these programs is in its second year: June Bugs! This group is designed for girls in the 3rd to 12th grade, and meets at the Communities In Schools office twice a week. Each session is devoted to a unique healthy activity, volunteer effort, or self-esteem building exercise. June Bugs head to Smoot Park during their first session! The girls start each session with a healthy lunch, with some time for fun and fellowship among their varying age groups. Through the program, CIS seeks to nurture comradery between girls of all ages — therein building peer-mentoring relationships that enable positive self-images and beneficial life choices. June Bugs is offered entirely free of charge, with support coming from individual donations, CIS site funding, and Dreams and Kite Strings. If you would like to donate towards one of these activities, please click here for more information. Our second summer program is for 1st through 8th grade students, and is hosted at the Moravian Falls Community Learning Center. Like June Bugs, this Forensic Investigation Summer Camp meets twice a week. During each session, the group works to solve “The Cookie Jar Mystery” through various forensic investigative techniques — fingerprint and shoe print analysis, fiber analysis, and more! This six session course will culminate with a trip to the Wilkes County Courthouse, where participants will work together in a mock trial to find the culprit. If you would like to know more about our Forensic Investigation Summer Camp, contact Tiger Posey at 651-7830 or by email here. Our great challenge for an even greater cause is just around the corner! Bring your friends and family along in May for the 11th annual Headed to College Race for Communities In Schools! Featuring a 5k, 8k, Uphill Battle, 1 Mile Color Run, we offer a little something for everyone. Whether you’re just getting started in the realm of fitness or you’re a certified enthusiast — join us May 16th and 17th for fun, fellowship, and a good run. Click here to find out more about our New Century Scholar program, the beneficiary of funds generated in the 5k and 5k Races. Also, learn more about the Wilkes Art Gallery — this year’s sponsor of our first ever Color Run! Navigate to this page in order to find out times, starting locations, and registration information for each event. Sign up online and save paper — and money on the registration fee! All the more motivation to go green, right? **Coming Soon! ** Find a current list of race sponsors — alongside level pricing and contact information for those interested! From water stations to a face painting, Communities In Schools hopes to offer it all in this unique and philanthropic endeavor! Navigate here to find out what’s new to our 11th Annual Race. Can’t come to the race but still want to donate to the cause? Head on over this way and make a donation online! — and see how some local celebrities compare as well! Admission: Adults: $5 | Middle and High: $2*| Elementary: Free! *Middle and High School Students free with two paying adults. We will have several celebrity guests out to test their knowledge during the event, with select students from area elementary schools there to assist as needed! Popcorn, drinks, and silent auction items will be available for purchase as well, so be sure to come out and join in on the fun! Flapjack Fundraiser for Elementary Clothing Closets! The event will benefit the clothing closets of Moravian Falls Elementary and North Wilkesboro Elementary Schools. Attendees are encouraged to bring and donate new and gently used clothing for area students, kindergarten through fifth grade. Tickets are $7.00, and include the flapjack breakfast and drink (coffee, tea, soda, milk, or juice) of your choice. You can even get your order to go! We encourage you to bring your families, friends, church groups, and civic organizations out to this event. Proceeds will benefit Communities In Schools programs at both elementary school sites. To order or reserve tickets, please call 651-7830 or email andie@cisnwnc.org today! In January of 2014, our executive director, Glendora Yarbrough, was given the opportunity to recognize five businesses for contributions towards our organization. As a nonprofit, our work among area learners would be crippled without the support of contributors, donors, funders, and volunteers — and we are ever grateful for those who find it in their hearts to contribute to our cause. Together, we are making strides to impact the lives of Alexander County students, providing them with the tools necessary to succeed academically, and achieve in life. (Left to Right) School Board Member David Odom, School Board Chairman Bridgette Rhyne, Duke Energy Representative Robin Nichols, CIS Executive Director Glendora Yarbrough, and School Board Member Milton Campbell. The following businesses were those recognized for their contributions toward our work in Alexander County. (Left to Right) School Board Member David Odom, School Board Chairman Bridgette Rhyne, Craftmaster Representative Kevin Mann, CIS Executive Director Glendora Yarbrough, and School Board Member Milton Campbell. Kevin Mann accepted a plaque on behalf of Craftmaster Furniture and Robin Nichols accepted a plaque on behalf of Duke Energy. The remaining plaques were distributed to the businesses unable to attend the meeting. The previous school year held a host of changes for Communities In Schools of Wilkes County. From our expansion into Alexander County, to a revision of our policies and procedures, to saying goodbye to five long-term board members – the year was eventful and emotional all around. One change we were particularly excited to see was the addition of two sites in the Wilkes school system: Central Wilkes Middle and Moravian Falls Elementary. For the first time, we were able to serve these two schools with site coordinators. If you are unfamiliar with site coordination at CIS, these staff members act as liaisons to bring resources, services, business partners, parents, and volunteers into their schools. 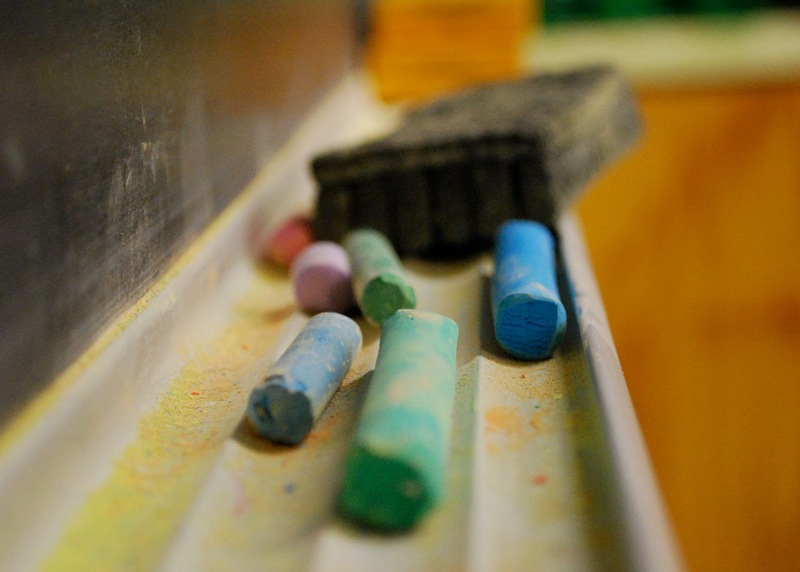 This collaboration fosters a proven community effort to help students succeed. Students at Central Wilkes Middle worked with site coordinator Lora Davis this year, who brokered in services such as Smart Girls and Wise Guys – our teen pregnancy prevention program – and Girls on the Run. She also organized special guest speakers for the students, such as Damon Nash who spoke on bullying prevention. Working at Moravian Falls were Tiger Posey and Amie Rose, where students participated in our Friends of Youth and Lunch Buddies programs, as well as the physical and mental health program Let Me Run. The two also worked within the community to bring in volunteers and donations for the school, successfully securing a dance machine, grill, and over 500 English and Hispanic books through First Book. The addition and continuation of these new sites was made possible through the Sisters of Mercy of North Carolina Foundation. In March of 2013, they provided CIS with $50,000.00 for salary support at the above two sites. Sisters of Mercy of North Carolina Foundation is a supporting organization to the Sisters of Mercy of the Americas South Central Community. This is one of six Communities of the Institute of the Sisters of Mercy of the Americas, an international order of Roman Catholic women religious founded in 1831. The organization seeks to promote systemic change and assist individuals to empower themselves to improve the quality of their lives. The foundation’s special heart for women, the elderly, and – specifically – children, made Communities In Schools’ site coordination a perfect fit as grant recipient. We here at Communities In Schools would be lost without the invaluable support of all our donors, volunteers, and grantors – but we would like to extend a special thank you to the Sisters of Mercy for this generous effort. 12th Annual Stuff the Bus Campaign! This year is no exception when it comes to summer vacation: it seems before you know it the end is in sight and the new school year is just around the corner. CIS of Wilkes County is gearing up for the 2013–2014 school year with our 12th Annual Stuff the Bus Drive! Through Stuff the Bus, CIS collects school supplies to be distributed to area schools and students for use throughout the school year. We accept a variety of donations, but are particularly seeking three ring binders, loose-leaf paper, pencils, and tab dividers this year. Those who wish to donate a backpack to the local YMCA will also be able to take advantage of a $1.00 joining fee special, a savings of $48.00 from the usual $49.00 fee! Donations will be accepted between now and August 15th, so make your drop offs today and help our area students start the 2013 school year ready and able to succeed! The relaxed schedule of summer offers our New Century Scholars a great opportunity for a head start on their yearly required community service hours. Program coordinator Melissa Higgins has worked hard to set up and schedule such service events. Nearest on the schedule, the Scholars will be assisting with…. At the drive, our young volunteers will help with donor check-in, as well as pass out snacks and drinks as individuals complete their donations. Please come on out for this great cause and receive this special attention from our student volunteers! If you would be interested in giving blood, please contact Melissa Higgins at 336-651-7830 or by email. Donors under the age of 18 will need to provide a completed parent consent form before they can donate. Click here to download a form.